Bedford, Freeman, & Worth’s Mathematical Models with Applications is a comprehensive high school mathematics course available in print format. 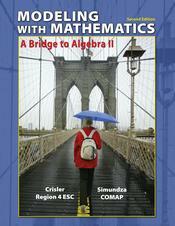 Content emphasizes concepts presented in Algebra I and Geometry in order to prepare students for Algebra II; all prerequisite topics for Algebra II are addressed. Instruction emphasizes the development algebraic, graphic, numeric, and geometric reasoning, as well as the use of functions to model real-world applications. Learning List recently published a review of this course. The first part of the course focuses on algebra and the use of linear equations and functions. Concepts in geometry are presented at naturally occurring points throughout algebra instruction. The course’s latter chapters separately address personal finance, data analysis, and probability. Throughout instruction students learn to identify the relevant elements of a real-world problem, represent them symbolically in a mathematical model, and explain their reasoning in written and spoken formats. Each chapter includes four types of lessons: (1) Activities, (2) Investigations, (3) Regular Lessons, and (4) Review and Practice. Activities are hands-on experiments that introduce topics and allow students to work collaboratively to collect and analyze data and answer related questions. Investigations are guided discovery activities in which students work with peers to analyze and solve real-world problems (e.g., create a function to help a business price its T-shirts). Regular Lessons provide direct instruction in key concepts. Each chapter includes one Review and Practice (RAP) lesson that reviews previously learned skills.